North Korea accidentally bombed one of its own cities. A new report on Wednesday revealed that North Korea accidentally bombed one of its own cities after a missile launch test failed this past April. The Diplomat first reported on the failed missile test, a Hwasong-12 intermediate-range ballistic missile that was launched from Pukchang Airfield in the South Pyongan Province on April 28, 2017. The missile didn’t fly higher than 70 kilometers, or about 43 miles, and it crash-landed dangerously close to a highly populated town. The Diplomat exclusively reported on the location of the missile crash, which was in Tokchon, a city that has a population of about 200,000 North Koreans. The crash landing reportedly caused extensive damage to a complex of industrial or agricultural buildings, The Diplomat said. 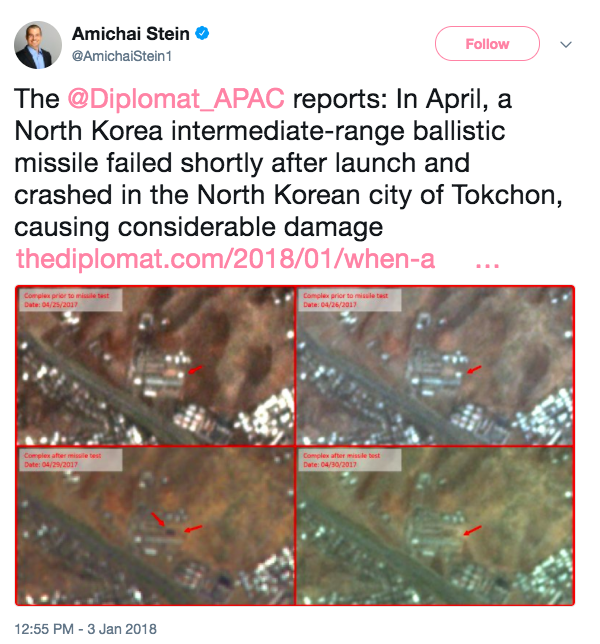 “The location of the missile’s eventual impact was revealed exclusively to The Diplomat and evidence of the incident can be independently corroborated in commercially available satellite imagery from April and May 2017,” it reported. Since April, North Korea has continued to launch missiles, including two intercontinental ballistic missiles (ICBMs) over Japan. While both landed in the ocean, this new report of a failed missile test certainly poses the possibility that a failed missile test over Japan could cause grave destruction there. North Korea launched an ICBM over Japan into the Pacific Ocean on Sept. 14, and then again on Nov. 29 of last year. The Nov. 29 ICBM test was North Korea’s most powerful yet, and experts have speculated that the country might be able to reach the continental United States. Kim Jong Un conducted 16 missile tests since February 2017, firing 23 various missiles. The September 2017 ICBM test marked its sixth ever successful nuclear missile launch, and North Korea claimed the country also has a Hydrogen bomb it can place on an intercontinental ballistic missile.